designboston: Design blog based in Boston, featuring news and information about architecture, interior design, product design, and green design from around the city and beyond.designboston: Joine says "Design global, produce local"
Dutch designer Maarten Baptist, co-founder of WATdesign, has teamed up with Daniël Watze to design what may be the most beautiful new coat rack in years. 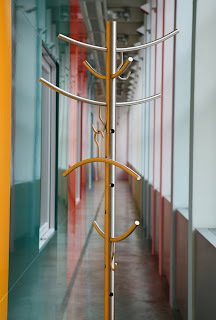 Visually, the Joine Sofia coat stand is quite elegant. The smooth, upwardly arching coat hooks reminded a friend of mine of the bowler hat in The Son of Man. Functionally, it is masterful. Those hooks actually double as coat hangers - no more wrinkly sport coats for you and yours! As useful and beautiful as it is, the Sofia's true beauty lies in the sustainable approach of the manufacturing and delivery process. "The downside of globalisation is scarcity. In other words: what is the point of shipping materials all over the globe if you can relocate production just as easily? It is better for the environment and a high standard of quality is guaranteed – and who would know more about processing bamboo than a Japanese craftsman? And, an added bonus for the consumer: the cost price is kept as low as possible." Instead of building the rack one way, in one place, and shipping it all over the world, Joine has opted to produce three models for three markets, using materials that are eponymous with that area. The European market is getting a stainless steel variety; in Russia, an oak version; Japan gets, of course, bamboo. Every model gets identical hangers. What? Nothing for America, you say? Patience, my friends. A shining, chrome American version is being considered, as well as a Brazilian tropical hardwood. Joine will be officially introducing the Sofia coat rack at Zona Tortona in Milan this week. I, unfortunately, will not be attending, but am interested to see what other great pieces come out of the show.